This dress was made from a re-released vintage Butterick pattern (#5605). I used a white and kelly green stripe cotton and wanted to play with the placement of the stripes. I made a chevron at the bust, placed stripes horizontally on the side gussets and tried to run the stripes vertically on the circle skirt, which resulted in some more chevrons. I love vintage patterns but sometimes it’s fun to make them a little more modern by modifiying them. I shortened the sleeves and skirt and adding a matching exposed zipper. It doesn’t read as a 50’s design to me anymore but I like the result. I don’t think I love anything I’ve ever made as much as I love this dress. It’s so perfect for the summer and I feel like magic happens whenever I wear it. This dress was a challenge to assemble – I have more info, photos and links of the resources I used to make it at my blog here. This is the most beautiful dress I’ve seen in a long time! Perfection. Cute! I love all of the stripes going in different directions! Very cute. Love what you did here with the stripes and chevron! Beautiful job using the stripes! And even though I’m usually a purist about keeping the styling original to the period, I love how you updated this to make it modern. Really impressed. Lovely job! Darling! Love the exposed zipper. Fantastic Job! You did a stellar job blending the retro and modern. Congratulations! Love the stripes. I think I may have wanted to cry trying to match them all up! Love love the chevrons!! What a great job with all the stripes. It’s a wonderful dress and you look great! My goodness! What an incredible use of the stipes. Fabulous job! Oh my gosh I LOVE this dress. You have done an amazing job with the stripes. I think I want to steal the idea for a project I have in mind for Butterick 4919 repro pattern. And the exposed zip is a fab idea to make the style a bit more modern. Well done! Thank you guys! I’m blushing like a beet. As for the stripes – it was actually way easier than I thought to line them all up properly, just a little more time consuming. Not half as annoying as trying to match patterns when the repeat isn’t as often. 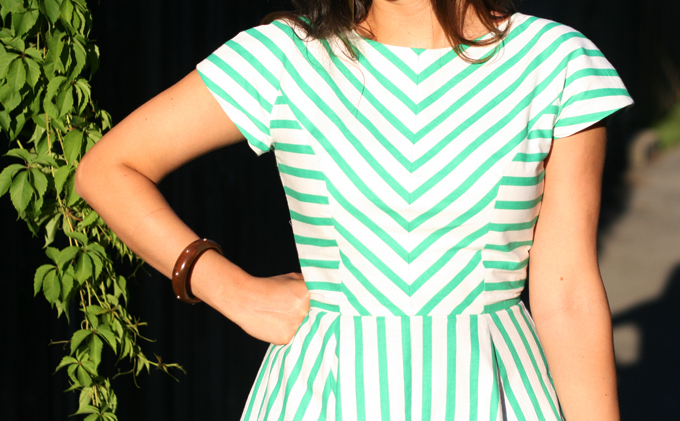 It’s delightful, love the green stripes and the dress!